Microelectronic Mechanical Systems, or MEMS, technology is everywhere we look. The biotech, medical device, communications, and inertial sensing industries are increasingly using MEMS devices as miniaturization allows new synergies. Micro-displays, ink jet print heads, IR detectors, blood pressure sensors, and accelerometers are a few of the MEMS devices being used today, and it is inevitable that new applications will emerge. 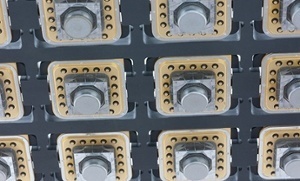 Some applications require MEMS devices to be packaged in a high vacuum environment. This means that the package is sealed under vacuum level below 10-06 torr. A certain level of packaging protection is required for all MEMS devices; however, IR Microbolometers, Accelerometers, Gyroscopes, Atomic Clocks and RF MEMS require an internal package vacuum or controlled atmosphere to prevent degradation over the life of the device. Design and fabrication of the specialized tooling required to successfully create the MEMS package. Process knowledge and profile development to ensure the system is tested, proven, and programmed to achieve the desired outcome. Since 1978, SST Vacuum Reflow Systems has developed and implemented the unique and complex mix of vacuum/pressure systems, materials expertise, programming and process profiles to achieve successful MEMS package creation. As a market leader in high vacuum MEMS sealing technology and the sealing process knowledge, our team will consult with you to assess, develop and implement the total solution you need to achieve your desired outcome. To learn more, please contact us about your high vacuum MEMS sealing application requirements.